˜… No More Cloudy Coffee ˜… We Have Fitted A High Quality Metal Filter On This French Press Coffee Pot That Leaves Little To No Grinds In Your Brew, Creating The Perfect Cup Of Tea Or Coffee In Under 4 Minutes.˜… Built For Durability ˜… This French Coffee Press Features An Extra Tough Heat Resistant Borosilicate Glass Carafe That Does Not Break As Easily As The Others, And High Grade 18/8 Stainless Steel Components That Keep Rust At Bay.˜… Sleek and Timeless Design ˜… This Personal French Press Has That Classic Coffee Maker Appeal, With Highly Polished Stainless Steel Accents Making It A Memorably Beautiful Gift For Any Coffee Lover.˜… Ample Capacity ˜… The 600Ml Capacity of This French Press Stainless Steel and Glass Coffee Machine Allows You to Brew Up To 6 Cups in Just One Pressing. An Ultra-Smooth Plunger Mechanism Makes For Effortless Use. Product Description:Kawachi brings to you a range of ergonomic, BPA-free, lightweight and durable kitchen equipment and accessories that help you enjoy your healthy drinks anytime and anywhere with minimum effort. The Kawachi bottles and flasks are designed in a manner that keeps your beverages fresh for a long time and also lets you prepare fresh beverages in an easy process. Now make different tea and coffee-based beverages with the help of this multipurpose coffee press. Features:The handle of the product is heat-resistant, thus providing a low risk of slipping from the hand and causing accidents.It has a V-shaped spout for easy pouring of the beverage from the pot to your cups and glasses.Durable constructionThis French coffee press comes with an extra tough heat-resistant borosilicate glass carafe that does not break easily. 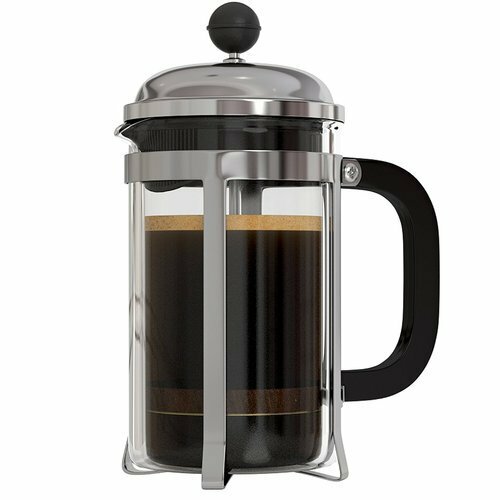 It also has stainless steel filter that does not allow rust to form.Easy to clean: This French coffee press can be disassembled for cleaning. It is dishwasher-safe and is suitable for hands-free cleaning. We are engaged in manufacturing, supplying, importing & exporting for healthcare equipments, home appliances, home furnishings, household items, electrical and electronic items, healthcare and fitness equipment and shoe organizer to both Indian as well as overseas clients. Established in year 1992, Kawachi Group, are professionally engaged in the marketing and promotion for wide variety of products. Our company started its initial operations in Mumbai but had opened its branch office in Nagpur in 1994 to look after the sales of Vidarbha and Marathwada area. Our company is currently operating under the expert guidance of Mr. Ajay Jogleker who is holding the maximum portion of our shares. Owing to dedicated group of 11-25 employees, the process of assortment of branded products take place from leading manufacturers that come with complete quality assurance. We are established under the Partnership Firm Registered under Indian Partnership Act 1932. Our team of experts relies on their sheer talent, creativity and zeal to create and make our amazing range of offerings available to all our esteemed customers. We have annual turnover of US$ 400 K - 1 Mn Approx. We also use television and print media for better promotion and marketing of our products. We have our huge client from China.